Esler:Ambassador, when we think of a change at the top, we think of elections, we think about a whole lot of people swept away and completely new people coming in. This doesn't look like such a big deal to those outside your country. Has it been a big deal? Ambassador Liu: I think it's a big deal in terms of China's future development with regard to the 18th Party Congress. I would say it's significant because it elected the new leadership which will lead the country for the next five years and even beyond. And this new leadership is young, energetic, and down-to-earth. They have a lot of experience with the grassroots, some of them even worked in the countryside and factories. And also this congress produced a new blueprint for China for the next five years and even beyond. That is to build China into a well-off society. The target is to double the GDP of 2010 by 2020. Esler:So in 10 years you'll double GDP. Ambassador Liu: Yes, in 10 years, not only double the GDP, but also double the per capita income of the people. Esler:What about that specific point that the new leader Mr. Xi made about corruption, which he knows really angers ordinary people?And you've got to crack down on it. But how you are going to actually do that, deliver, because it will make these people even angrier if you don't do it in these five or ten years. 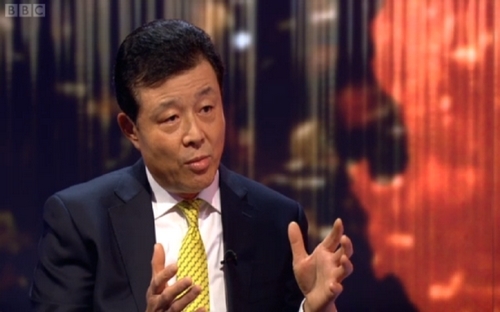 Ambassador Liu: I think corruption is, you know, not a problem for China alone. Once you are in a period of social transformation, it's unavoidable you have all kinds of problems. Just like Deng Xiaoping once said at the beginning of opening up of China. He said "when we open the window and let in the fresh air, it is unavoidable that flies and mosquitoes will be in." But the important thing is how the party face up to it and adopt measures to deal with this problem. I think the leadership is resolute and determined. Esler:Do you see things like the Internet as being like flies and mosquitoes? I mean do you see it as a bit of an irritation. Because again, from our side, we don't understand what you are worried about, when you want to control how people exchange information. Ambassador Liu: I think there is a misperception about the Internet development in China. In fact, China is much open in terms of the Internet. In fact, we have the most internet users in China today. Esler:But our correspondent can't even get onto Facebook when he's in China. I mean you can't get onto twitter. It's not quite as you presented. Ambassador Liu: In China, every day, there are hundreds of thousands of comments made by bloggers and 66 percent of Chinese internet users make comments online. It is up to the government to regulate the use of internet in protection of the safety of the internet to ensure that healthy content is available and unhealthy content should be removed. Esler:But isn't that really up to the ordinary people to decide. Looking at the history of your country, you've had thousands of years of creativity and we see creativity is based on the free exchange of information. And part of the reasons why people in the West think your crackdown has been very hard on bloggers and is very difficult for some people because you don't like certain ideas. Ambassador Liu: If you are in China and get connected to Internet, I think you can get all kinds of opinions. It's much open and a lot of things can be debated including politics, economic, cultural affairs. I think you have to have a big picture of the internet development in China. Esler:Ambassador, can you help us with the main point, which is you may become, as the ambition is doubling the GDP by 2020, the world's biggest economy, but what world role does China want to have? Ambassador Liu: China certainly wants to play a role as a responsible country. We call ourselves the largest developing country with global responsibility. We want to contribute to peace, stability of the world because we need a peaceful environment to develop our own country. Esler:Because you couldn't have that economic development without peace. Ambassador Liu: That's right. And China's peaceful development in turn will contribute to peace and prosperity of the world. And I think China's growth is also a big contributor to the world economic growth. Esler:How does that square with what seem to us as quite small problems which could become very big problems, for instance the potential for conflict with Japan over a bunch of rocks in the sea. Ambassador Liu: We certainly would like to have good relations with Japan. I know you are talking about the Diaoyu Islands. In fact, these islands have belonged to China since ancient times. Esler:You know this is not quite how the Japanese see it. We are worried about it. Ambassador Liu: It was not until 1895 when China lost the first war with Japan that Japan illegally seized these islands. It was in 1943 when Churchill, Roosevelt and Chiang Kai-shek met in Cairo. They issued the Cairo Declaration. And in this Cairo Declaration, it declared in explicit terms that all territories seized by Japan from China should return to China without any conditions. Esler:Does that mean you can resolve it peacefully, you think. Ambassador Liu: Of course, we want to resolve this peacefully with Japan. Esler:One other issue which China has had a role which has been very controversial, which is the question of Syria. We've got President Putin saying that we are not concerned about the fate of the Assad regime. Is the Chinese government concerned about the Assad regime? Ambassador Liu: We are concerned about the fate of the Syrian people. I think it's up to the Syrian people to decide who will be their leaders. So the reason why China opposed some of the resolutions tabled by Western countries in UN Security Council is because these resolutions called for regime change. Esler:Do you think it will be a bad thing if Assad went? Ambassador Liu: I think it's up to the Syrian people. If the Syrian people believe what is good to them, we will agree with them. It's not up to China to decide who should be their leader and what kind of the regime should be in place. I think it's up to the Syrian people. Esler:But isn't it kind of obvious that most Syrian people want to rid of him and they would like help from outsiders. And that is a problem. Ambassador Liu: It depends on which side of the Syrian people you are talking to. I think Syria is in a civil war situation. You have opposition and you also have the people behind the government. So the important thing is to bring the ceasefire to immediately start this political transition process. I think that's the most important thing to stop violence. Esler:One of the big things we in the West have to get our head around is perhaps summarized by British writer Rudyard Kipling, who said that the East and the West will never completely understand each other. Do you think that's true? 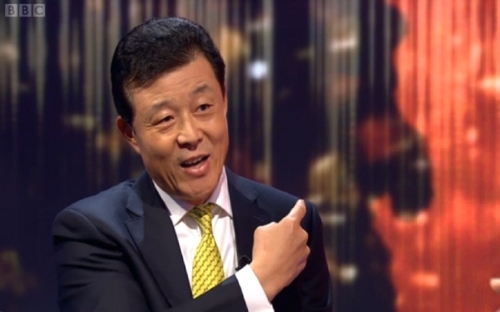 Ambassador Liu: I think there's a problem for Western countries to understand China. There's a strong bias against China. When it comes to China, some people are still haunted by this cold war mentality. They do not like communist party, so whenever they see China, they see China through the lens they use to look at the former Soviet Union. And that really prevented them from having a big picture of China. So I do hope that we have more sense and sensibility rather than pride and prejudice. Esler:Right. It was a quote from another famous English author. I mean in terms of that, so much has changed since Deng Xiaoping era, even the phrase Chinese communist party does not sound to outsiders as if it sums up where China is going. It sounds like a very uncommunist communist party. Ambassador Liu: I think there's a misunderstanding about the communist party in China. In China, the Chinese Communist Party still upholds the path of Chinese socialism. We call it socialism with Chinese characteristic. It has combined the Marxist theory with realities of China. The system suits China. It can deliver. It's successful. So why should we change this system when it's still effective and it can still deliver benefits to its people and is welcome by its people. Esler:You've been very clear on how we might misunderstand you. Do you think you sometimes misunderstand us, which is in saying that when we talk about human rights issue, the internet, all those kinds of issues which seem quite important to us, it's not to be triumphant about that, it is to suggest actually you will be a more creative country if you have some of these. Ambassador Liu: We welcome criticism with good intention. Because we don't think China is perfect. Just like any countries, there's much room to improve. But we are strongly opposed to interference in China's internal affairs and the use of human rights as tools to change China's political system, to humiliate China. That is something we can not accept. Ambassador: I just want to mention one thing about how we have difference. Like the map behind me. There is one mistake. There is one important part of China that is missing. That's Taiwan. It's much bigger than the Hainan Island. We Chinese people hold territorial integrity dearly. Esler: Indeed. Perhaps you come back; we can talk again about this. Thank you. 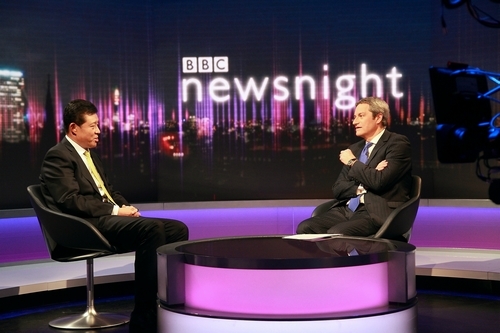 Newsnight is one of the best known current affairs programs on BBC TWO. It has built a reputation for the depth of its analysis and intensive cross-examination, with strong influence across the broad spectrum of politics and intelligentsia. 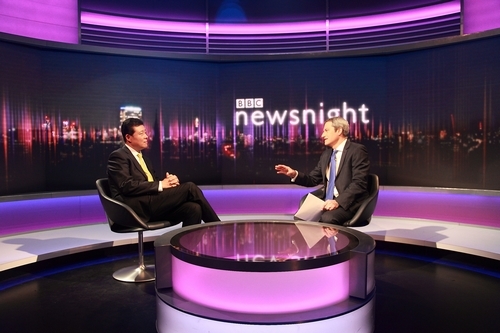 Being a prominent author and correspondent, Mr. Gavin Esler joined the Newsnight in 2003 and has interviewed a collection of world leaders.